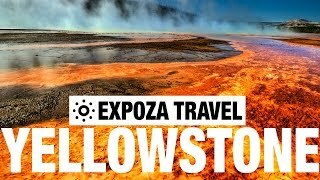 Travel video about nature park Yellowstone National Park in the USA. Located in the northwest of the U.S.A., in the state of Wyoming, is Yellowstone, a national park of the superlative, in which the impressive white water of Old Faithful is today one of the most famous and most photographed natural spectacles in the world. Indeed, for more than a century, this mighty geyser has been the proud and unique landmark of the oldest national park in the United States. The Yellowstone National Park is famous for its highly visible geological processes. The area close to Old Faithful not only features a number of geysers but also numerous hot springs that highlight the tremendous thermal power that lies beneath the earth’s surface. Today, the Grand Geyser is the largest active geyser in the world. Its huge eruptions occur every 8 to 14 hours and last for 9 to 12 minutes and can sometimes reach a height of 60 metres. The Yellowstone is one of the largest volcanoes in the world. Because it is located directly above a geological hot spot, a huge cave constantly fills with magma. It is situated at a depth of 8 kilometres and is the reason for the park’s visible geothermal activity. Some kilometres south of Nymph Lake is another geothermal area, the Norris Geyser Basin. This area is unique among the landscapes of Yellowstone Park as it is not only the park’s hottest area but also boasts the largest geyser in the world, Steamboat Geyser. Although Yellowstone National Park is important for North America’s plant and wild life, this 9,000 square kilometre nature reserve is primarily a geological park. Amazing, fantastic, incredible and wonderful. How can you put into words a place that provides so many remarkable glimpses of the inner workings of Planet Earth?